If people were collies. If people were collies, the world would be a better place. Collies are unique dogs. They are highly intelligent—which can be a hardship. You must be smarter than your dog to train it. Collies are usually smarter than me. That means I wind up well trained for them. They continue joyfully on in life just like they started out! Collies are gentle. They are usually non-aggressive, friendly dogs. They won’t bite humans or fight with other dogs. You can walk them off leash without worrying that they will hurt someone or something. You don’t cringe when strangers approach to pet them, or when babies suddenly launch themselves at them. Collies are curious. Because they are smart, they want to understand everything. Because they are gentle and non-aggressive, they will almost never attack other animals. They make friends with cats, deer, birds, opossums…anything that will stay still long enough to foment friendship. But the thing that I love most about collies is their desire to please. They would rather have love and praise than treats. 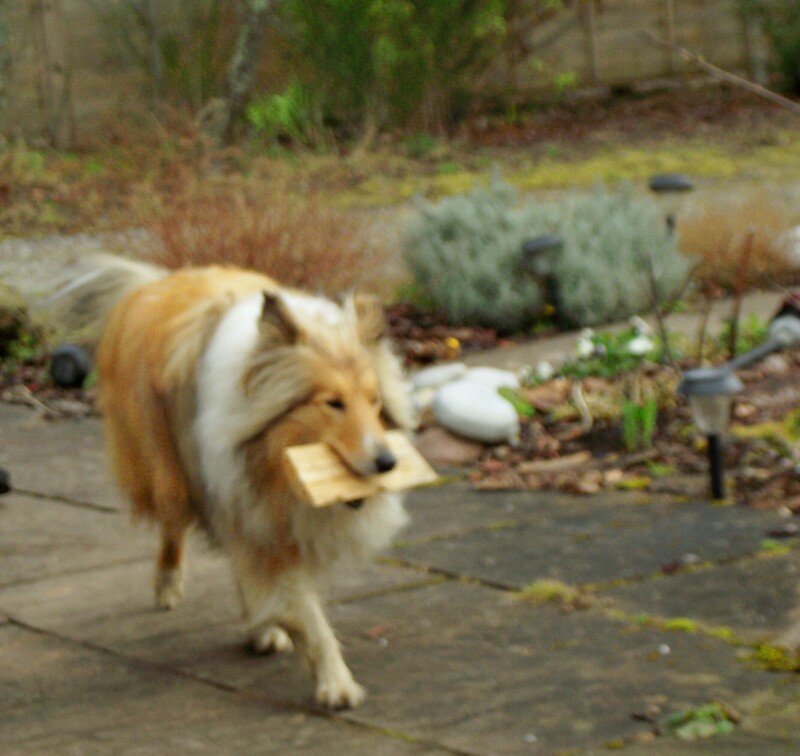 Our dog Angel Joy goes out to the garage and brings in wood with us. She doesn’t do it for treats. Just praise. Just to help. So if people were collies, the world would be a better place. Everyone would be friendly, affectionate and eager to please. That’s how we should live before God. Praise, prayer, and an inward desire to please Him. When the Bible states that, “Fear of the LORD is the beginning of wisdom,” it is saying that we need to love God so much that we are afraid to sin and break our fellowship with Him. The most important reason I write books like Bridge to Nowhere, Heart Shadows, Until the Shadows Flee and Shadow Chase is to offer readers books that are entertaining and fun to read, but that honor God. Other authors will outsell me, have more speaking engagements than I do, gain more fame. I’m glad for them. I hope they enjoy their success. My earthly rewards from writing might not match theirs, but each Christian mystery-romance-suspense book I write is another jewel of praise, prayer and sacrifice in the crown I’m creating for my Creator. When I get to Heaven, just being able to bow before Jesus and place it as His feet will be reward enough. Hey, thanks, Angel Joy! I’m learning a lot from you. You’re collierizing me already! Posted on March 14, 2013 by authorstephanieparkermckean •	This entry was posted in Uncategorized. Bookmark the permalink.